gitaneusa.com :: View topic - Jojon 1975 Interclub or ? gitaneusa.com Forum Index » Owner Gallery » Jojon 1975 Interclub or ? Jojon 1975 Interclub or ? Is this an Interclub ? What was the original equipment of this bike ? They originally came with Simplex derailleurs, Mafac brakes, Normandy high flange hubs with sewups, Pivo alloy stem and bars and steel cranks with Lyotard pedals with toe clips. The seats were terrible just like those on Grand Sports. Later versions came with 2 piece Sugino Maxi cranksets like on your bike. Many people switched from Simplex to Suntour derailleurs. This seems a good answer for my question! For better responses I suggest that you post your questions like these to the Vintage section of the Forum. This section is usually reserved for "finished" projects. The quote you posted refers to the pre 1974 foil decal Interclubs. From about 1973 until 1975 US model Interclubs shipped with Sugino Maxi alloy cotterless cranks, About 1975 they switched to Nervar cast aluminum alloy cranks. Also, the frames had Huret honeycomb rear dropouts. Previous models before 1974 had flat, stamped steel dropouts. They should all work well, just not original. Gitane made differently equipped models depending on their intended market. A lot of bikes for the French or Benelux markets were different from those sold in other parts of the continent, same with the UK and the US. 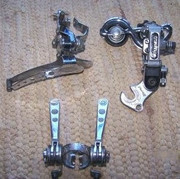 Between 1974 and 1977 Interclubs sold in the US came with Simplex Criterium derailleurs or Huret Challenger derailleurs. I've seen pictures of post 1974 European model Interclubs with Huret Svelto derailleurs and cottered steel cranks. In 1974 the US model Interclubs probably came with tubular (sewup) wheels. In 1975 they had 27" Mavic Module E rims with Michelin Elan 27 x 3/4" tires (which were notorious for blowing out the casings just sitting in the showroom). Here is a US model 1976 Interclub with a 3 tubes Reynolds 531 frame, long point lugs and Nevar cranks. Your bike has a trace of a Reynolds 531 decal on the seat tube plus the long point lugs. In 1976 Gitane upgraded the Tour de France model with a full Reynolds 531 frame. They probably switched the 1974-75 TdF 3 TUBES RENFORCES Reynolds 531 frames to the Interclub as a marketing upgrade. So my Gitane is probably a 1976 Interclub ! This gives a more "Original" look ! I post more pictures when finished.